On June 22, 1940, France had signed an armistice with Germany following a decisive loss. Under the terms of the truce, the northern half of France would be occupied by German troops while the French Vichy Government, subordinate to the Germans, would control the southern half. Four years later, on June 6, 1944, Allied forces landed at Normandy, in northwestern France, to begin their advance across France and into Germany. From the south, the 7th Army rapidly advanced through the Rhone Valley to northeastern France. It reached the Vosges Mountains, near the German border, where enemy forces had been strengthening their defensive positions for weeks. The 7th Army’s plan was to launch an offensive to capture key passes in the Vosges and then cross the Rhine River into Germany. The 100th/442nd was now attached to the 36th Division, commanded by Major General John E. Dahlquist. Originally a Texas National Guard unit, the 36th was still referred to as “the Texas Division,” even though it had suffered heavy casualties in North Africa and Italy and now consisted of replacements from many different states. After 10 days of training and testing new equipment in southeast France, the 100th/442nd boarded trucks, arriving in the Vosges Mountains on October 9. By this time, very few original members of the 100th were left. On October 14, the 100th/442nd moved towards the town of Bruyeres and embarked on two weeks of almost-nonstop combat. Trees in the Vosges Mountains were so thick that they often blocked out the sun. Rain was frequent, oftentimes turning into ice, and the fog was dense. The Germans had seeded the hills with mines and had planted machine gun nests in strategic locations. Among the horrendous conditions were lethal tree bursts — shells that exploded when they hit tree tops, scattering metal fragments in all directions. In addition to these conditions, General Dahlquist, who had little combat experience, ignored his advisors and intelligence from the front lines and often commanded units to advance before they were able to consolidate their positions with adequate supply lines and artillery support. Along with casualties caused by tree bursts, gun and artillery fire and mines, trench foot also took a huge toll on the men. Bruyeres was surrounded by a series of hills. The 100th was ordered to capture Hill A, the most heavily defended of the hills by the Germans. 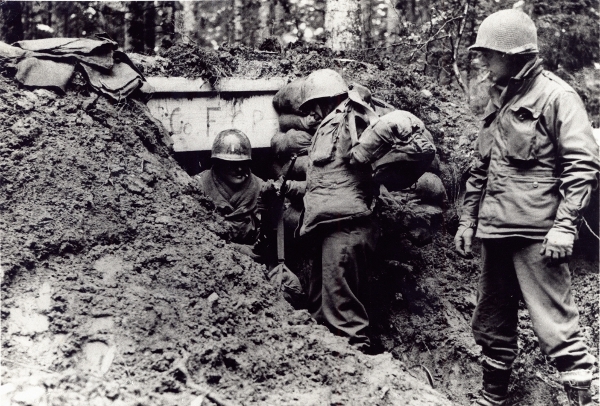 The 442nd’s 2nd Battalion was assigned to take Hill B, located north of Bruyeres, and the 3rd Battalion pushed through a valley and into the town. 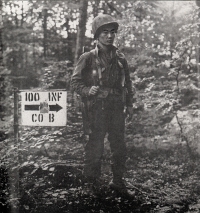 The 100th/442nd battled continuously in wet and freezing weather for four days, finally defeating enemy forces on October 19. After suffering for four years under German occupation, the citizens of Bruyeres never forgot the Nisei soldiers who liberated their town. Lasting friendships were formed that continue today. While the 2nd and 3rd Battalions continued to clear the area around Bruyeres, General Dahlquist ordered the 100th to take the nearby town of Biffontaine, which had almost no strategic value. Biffontaine and the forest around it were full of German troops who used houses, barns and other buildings for cover. The 100th was cut off from the 442nd and fought continuously for 24 hours. Relief finally came from the men of 3rd Battalion, who broke through German lines and helped push the Germans out of Biffontaine on October 25. 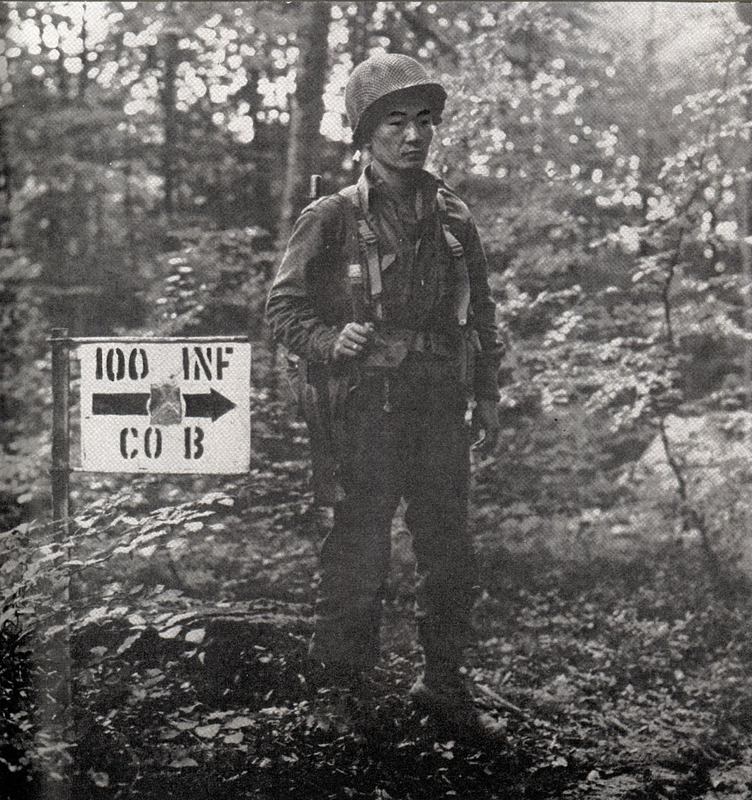 During this battle, two more experienced and respected 100th officers — Captain Young Oak Kim and Captain Sakae Takahashi — were wounded and left the battlefield. Both had arrived in Italy with the original 100th Infantry Battalion.